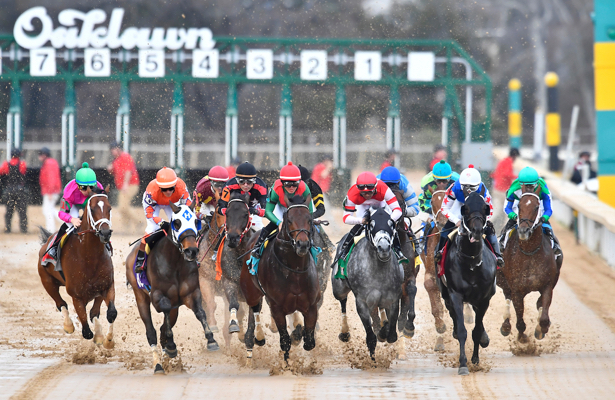 Oaklawn Park is offering an enticing Pick 5 wager on Arkansas Derby Saturday, and the Oaklawn Handicap (G2) and Arkansas Derby (G1) are part of the competitive sequence. Saturday's Pick 5 will start with Race 8 at Oaklawn, an optional claiming route with a scheduled post time of 5:47 p.m. ET, and runs through Race 12, a maiden special weight route. 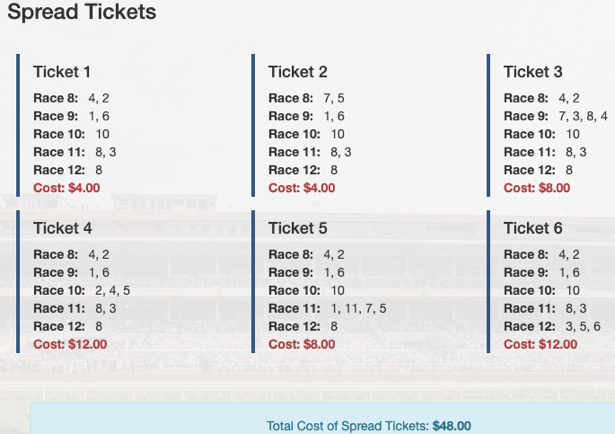 Once again, I will use one of my favorite cost-effective Pick 5 wagering strategies, the spread ticket formula. It would cost $1,152 to lump all of my contenders on one ticket, but the spread ticket formula knocks the price down to a very affordable $48. #4 MERCER ISLAND (4-1) looked good winning in the local mud at this distance Feb. 7 but did not follow through in a fifth-place finish on a fast track at one mile on March 16. He can bounce back in his third start after a layoff under his new rider, Joel Rosario. #2 Mo’s Mojo (7-2) added blinkers and ran well in his two local routes. He owns a 2-for-3 wet track record and Saturday's rider, David Cohen, got to know him in a place finish on March 24. #7 Hollywood Critic (3-1) finishes second and third more than he wins. The vulnerable favorite is 0-for-4 at Oaklawn, 0-for-4 on a wet track and 0-for-10 at this distance. He could easily hit the board again and perhaps he will move forward in his second start for sharp trainer Robertino Diodoro. #5 Catdaddy (4-1) is another with an affinity for minor awards. The 2-for-23 gelding is 0-for-8 at Oaklawn. #1 TENFOLD (7-2) adds blinkers after a close-up fourth March 5 as the chalk in his first start since last summer. Last year, he won pair of local routes over the winter and captured Saratoga’s Jim Dandy (G2) at this distance in the summer. All three wins under Saturday's rider, Ricardo Santana Jr. He handled a wet track in the 2018 Preakness and projects a ground-saving, tactical trip. #6 Giant Expectations (3-1) needs to get to the lead under Joel Rosario. If that happens, he can go all the way. I do not think that he can sit and out-finish these at a mile and an eighth. #7 Quip (4-1) dueled and ended up an OK third in a race he needed in the Hal’s Hope (G3) on Feb 23. Jose Ortiz knows him now and he should be forwardly placed. In his lone wet track attempt, he finished a distant last in the Preakness. #3 Chris and Dave (20-1) moves up on a wet track and might get his preferred footing. This class level might be a bit too tough, but he projects a decent tactical trip and has earned some competitive numbers against lesser foes. #8 Lone Sailor (5-1) hardly ever wins, but his late run is frequently good for a share. Flavien Prat takes the call. #4 Lookin At Lee (6-1) landed the place in all three wet track starts and will try to get involved late under Mike Smith. #10 TIZ MCNAMARA (5-1) is lightly raced and on the upswing for Brad Cox. He exits a sharp flat mile maiden win on a fast track and is bred to handle the mud. Jose Ortiz rides, and an outside stalking trip is expected. #2 Lighthawk (3-1) followed up a local maiden win at six furlongs Feb. 2 with a neck defeat at this distance March 1. Joel Rosario hops aboard, and he should maintain sharp form in his third start after a layoff. He was nowhere in his lone wet track attempt in February 2018. #4 Combatant (5-2) is a 1-for-15 stakes dropper. The surface switch probably helps, but I do not trust him on the win end at underlaid odds. #5 Single Gem (6-1) exits a romping $30k/3L wire job and was nabbed out of that heat by competent conditioner Cipriano Contreras. His best shot is to get out there and control the tempo. #8 COUNTRY HOUSE (12-1) is slowly improving for Bill Mott, and this would be a great time to put it all together. Joel Rosario might be a good fit for this one, plus there is pace to chase today. He was off slow and wide in the Louisiana Derby (G2), and he flattened out in the lane after putting in a big run around the far turn. Plus, the speed did not come back that day, but it might in this spot. #3 Omaha Beach (2-1) has put in all together in his last pair and gamely beat Game Winner in the second division of the Rebel Stakes (G2) back on March 16. He is firing bullets for this and could easily score again. #1 Improbable (8-5) adds blinkers going from the outside post in the Rebel Stakes (G2) to the rail in this longer event. He won all three starts last year from inner posts including a razor-sharp score from the inside in the Los Al Futurity (G1). He drilled a Santa Anita bullet for this on April 5. #11 Long Range Toddy (5-1) always finishes in the top three in these points races. He will have to work out a trip from the outside post after he upset Improbable in the first division of the Rebel Stakes under Jon Court. #7 Galilean (10-1) removes blinkers after an OK third in the first division of the Rebel Stakes. He figures to stalk the pace under Flavien Prat. #5 Laughing Fox (20-1) was pinched at the start and never got involved against Omaha Beach last time. He fired a bullet in the local mud April 8 and deserves another chance in the stakes ranks. #8 VERVE’S HUMOR (7-2) is on the upswing for Dallas Stewart (strong stats with third after a layoff starters), and he handled a route of ground in a clear place finish behind Tiz McNamara on March 7. He puts blinkers back on, fired a local bullet for this April 3, and Mike Smith takes the call. #3 Rotation (3-1) hit the board in both MSW dirt routes and earned an improved number March 16. He can graduate if he gets some pace help. #5 Flatout Winner (5-1) took money, chased the pace, and finished second in his Fair Grounds sprint debut March 5. He is bred to route and could easily move forward for Joe Sharp. #6 Cowboy Dilpomacy (5-2) hit the board as the beaten favorite in both starts including an OK third from outer post at this course/distance March 16.